My response to Ailsa’s travel theme (Where’s my backpack): a clock that has travelled around the world and a book about a family shaped by agoraphobia. The clock was made by Brendan Adams, a ceramic artist based in Auckland, New Zealand. I bought it on a visit “home” while I was living in England. It was a birthday present for my partner and I had to carefully hide it in my hand luggage on the return trip to make sure, a) it didn’t get broken and b), he didn’t find it before his birthday. The clock travelled around England with us for about six years then made the trip back to NZ; this time professionally packed and locked in a shipping container. Like us, the clock has been in its present home for 13 years now. 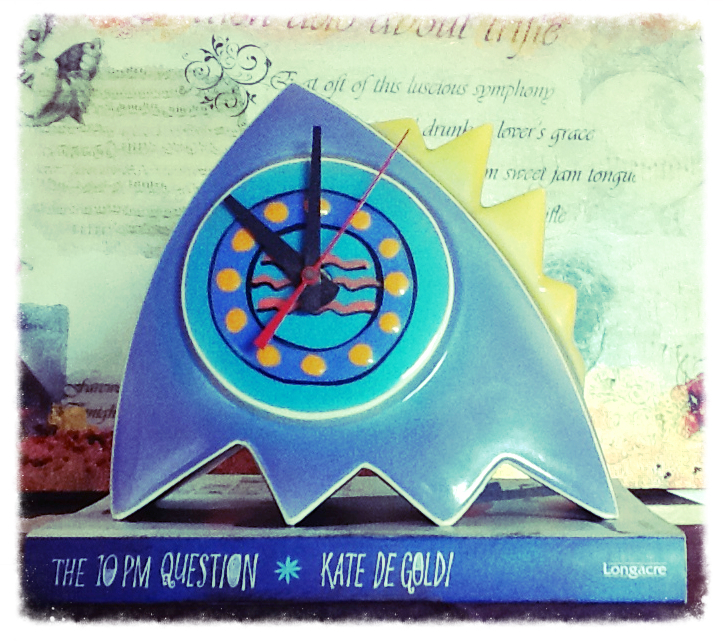 I love ceramics; and to me this wonder rocket-shaped clock has always suggested movement, travel, adventure – the very things that Frankie’s mother – Ma – fears, in Kate de Goldi’s The 10pm Question. I bought this book for my son who, as he does, devoured it virtually in a sitting. Then I read it and wondered why no-one seemed to write book like that for young adults when I was a young adult. I’ve gone back to it a couple of times, and still think it is one of the best written, most beautiful novels I’ve ever read. Books are essential to travel. I can’t imagine hours on planes, trains, ferries without a book. Nor nights in strange beds without the lullaby of verse to comfort and soothe. 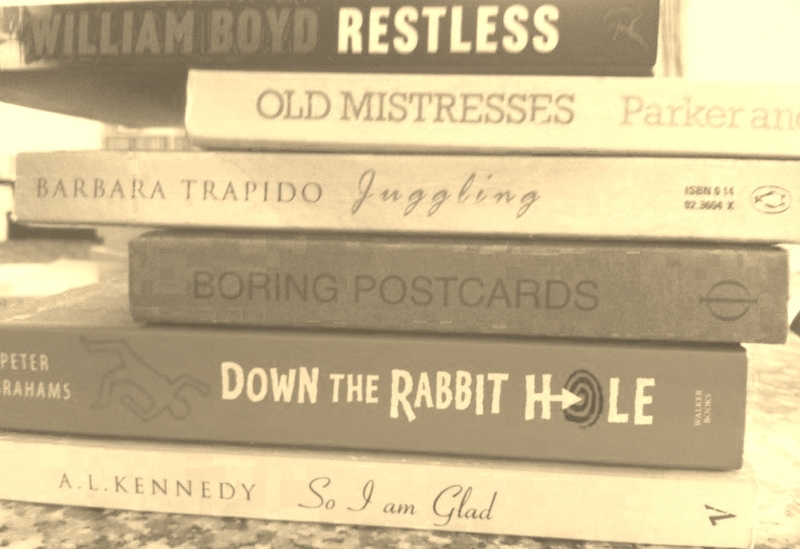 A textual mash-up; book spine poetry. Restless old mistresses juggling boring postcards down the rabbit hole. So i am glad. A green green goes green … or something like that. Ailsa’s “Green” theme (Where’s my backpack) got me thinking about how the word has so many connotations; the colour, the sense of environmental responsibility – and also “green” as in inexperienced. And that got me thinking about my garden. 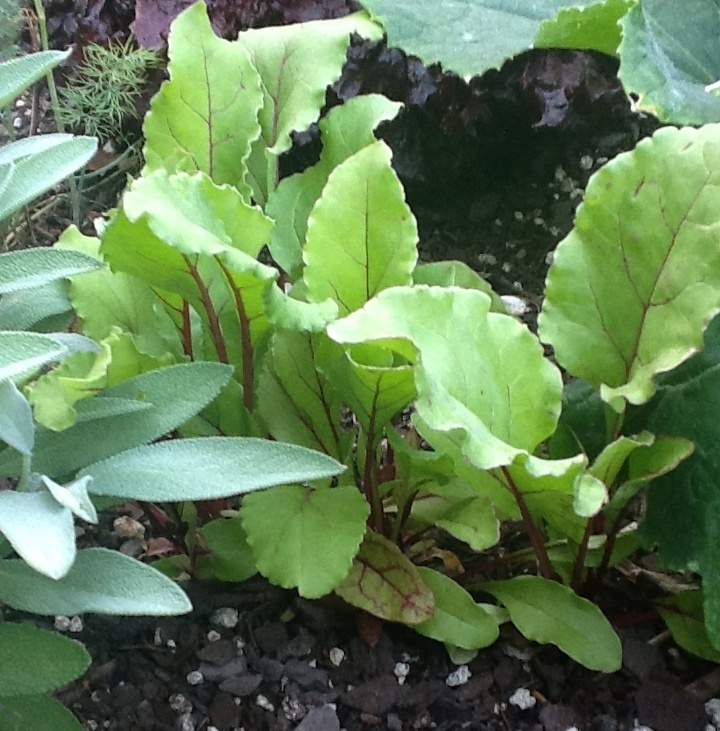 Last November, lots of seeds and seedlings. Even though I’ve owned my house for 12 years and wanted a vegetable garden for about that long, this last year is the first time I’ve had one. And it’s been wonderful. 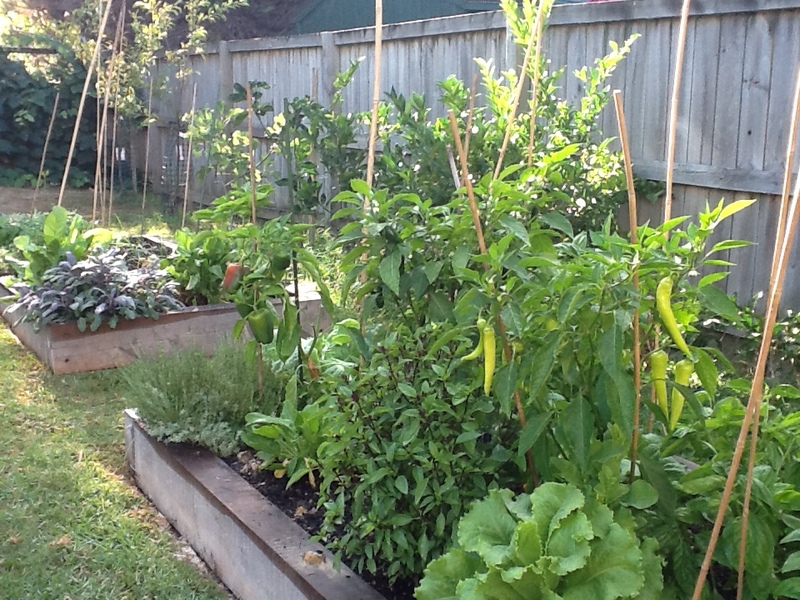 It’s lush and green – despite the drought in Auckland. It’s great for the environment – food miles have become food metres and my plants thrive on the compost we’ve been creating from household waste. And although I’m totally “green” as a gardener and have made lots of mistakes (note to self – courgettes take up a lot of space and although they look great, they’re still courgettes), I have also grown a lot of fresh tasty organic food for my family, friends and neighbours. Finally, if green is the colour of calm, then my garden has achieved another purpose. The time I spend planting and thinning and weeding and just generally pootling around eating the tomatoes and radishes and bell peppers is perhaps the most relaxing time in my life at the moment. 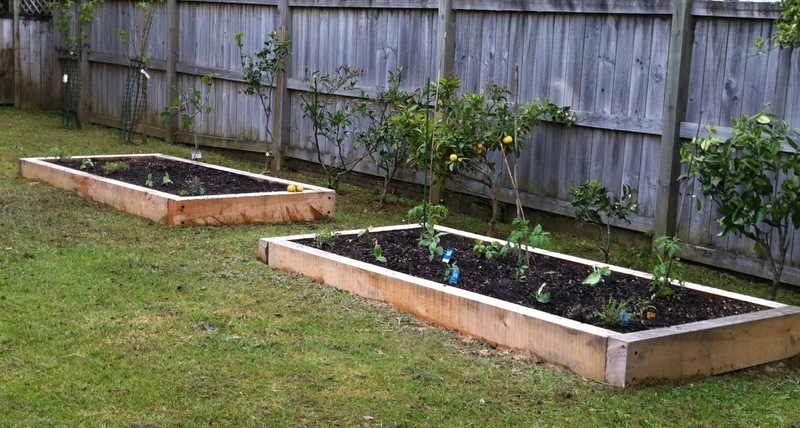 The radishes and courgettes are gone. 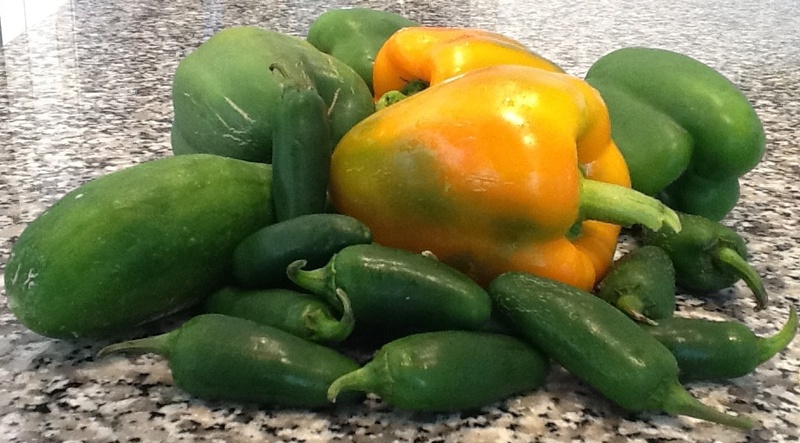 Cucumbers are just hanging on and tomatoes are having a second crop. But the herbs and peppers are still thriving. ain’t no use in tryin? This song was released in 1965, so I kinda missed it the first time around. In fact, the first time I remember actually listening to it was in 1985. It was a wet, cold Friday and I was visiting a friend and her young baby. She was the first of my friends to have a child – and for quite a long time – the only one. I was in the middle of a post-grad course and totally at sea trying to put together a manageable thesis proposal. My life revolved around study and partying (probably not in that order), and I think I both pitied and slightly envied her “not having to work” but just being home with a baby – probably reading books and watching tv most of the time. It took another ten years and a child of my own to see how wrong I was about that. At the time I didn’t realise she had post-natal depression; I’m not even sure she knew it. To me she just seemed a bit dull and disinterested in things I wanted to talk about (like my totally fascinating and complicated love-life). So when I went to visit, I don’t quite know what I expected we’d do, go out for lunch or something I suppose. But instead we listened to her old records and I appreciated her taste in music. It was probably a good thing we did, because – quite honestly – being the shallow, self-obsessed creature that I was in those days, without that reminder of her cool, I might have given up on the friendship. I’m glad I didn’t. We’ve been friends for thirty five years now, and although we don’t see each other often, I value her presence in my life. She’s funny, wise, accepts me as I am – and she knows where all the bodies are buried! In many ways, we’ve continued to live divergent lives. 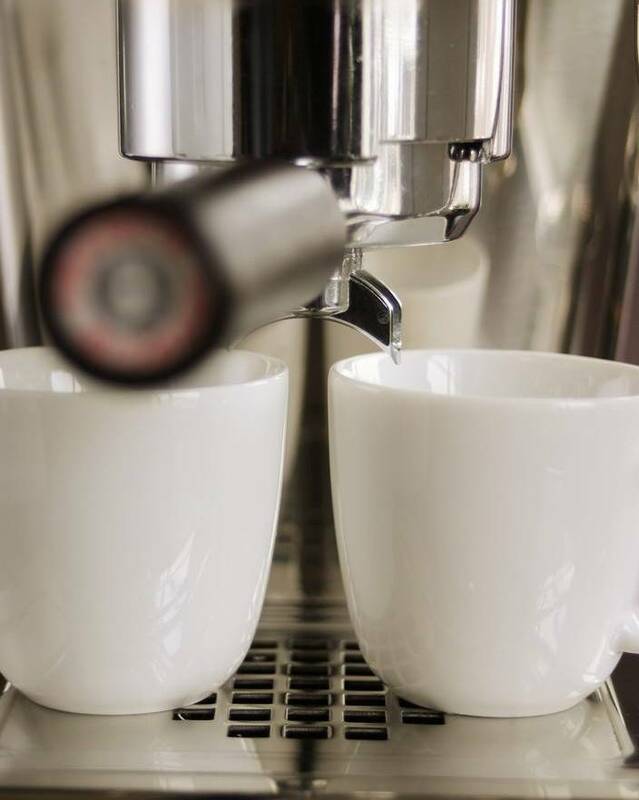 Our socialising pretty much takes the form of meeting for morning coffee every few weeks. Our partners know each other, and we have “done dinner” in the past – but not recently. We text often and both make an effort to find each other the funniest, most outrageous birthday and christmas cards. I’ve kept some of hers, including a couple that go back to my student days and which live on the pinboard above my desk. Ours in a friendship that has never really known conflict, or even drama. It wasn’t forged in adversity or pain. Somehow, as teenagers we recognised in each other some kindred spirit and that has been enough. When I started writing this post, I realised that there are no photos of us together. None at all – in 35 years. And that makes this post important to me, because in the future, if my son ever looks through the photographic record of his mother, a piece will be missing. A kind, funny, clever friend whom I care for deeply and who has shared my journey for well over half our lives. I guess I could take a photo of us next time I see her, but I probably won’t. Somehow that feels like it might upset the balance, and I like things the way there are.